This is it. The Yo, Hackie! blog is going, going, gone . . . It's been a wonderful year of blogging. I got to share my TV addiction. I took and posted a ton of on-the-job pictures. I commented on the stories-behind-the-stories that go into the biweekly columns. And most fun, I wrote about "stuff I love." Actually, the most fun was exchanging with blog-readers who commented on the posts. 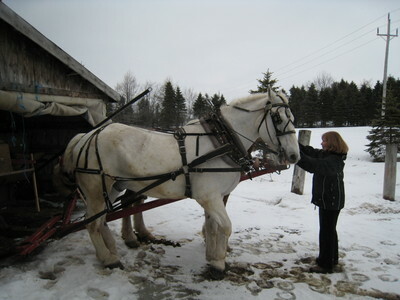 Lucky hackie got booked for a fare into the Eastern Townships of Quebec. 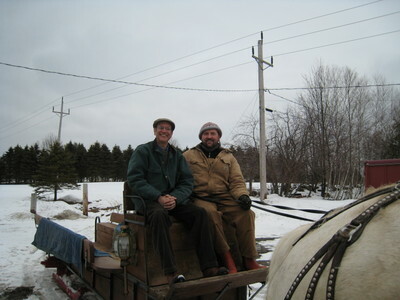 My customers and I tooled around the border towns just north of the Richford crossing. 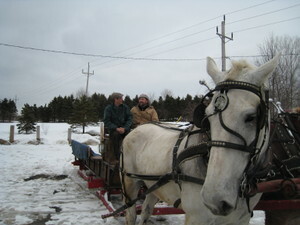 At one point in the festivities, we visited a stable for a sleigh ride. The horses were magnificent! 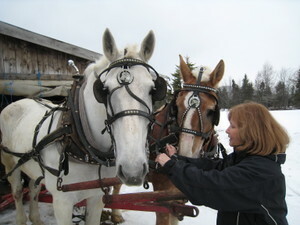 A white and a brindle Belgian, the size of medieval dragons, huffed and puffed and snorted as they dragged the Americans through the white countryside. 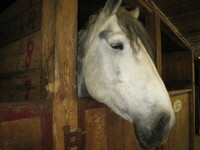 Our Vermont Justin Morgans are a gorgeous breed of equine, but - let's be honest - they're kind of shrimpy. These Belgians, man oh man, them are horses! How awesome is Patchen Road? Never mind the speed traps - Patchen Road is the mother of all shortcuts. It will take you from Gracey's Corner on Williston Road, over the Interstate, onto Burlington's Grove Street, and thence onto Chase, Barrett and over the Winooski Bridge or the hook-up with Riverside Avenue. All hail Patchen Road! Last week, amidst rush hour, I employ this road. After taking the left from Grove onto Chase, in front of me I see a long line of cars backed up on Barrett. No problem-o, thinks your trusty cabbie, and I yank a right into the back entrance to the Chace Mill. The Chace Mill, you see, puts you on Mill Street just before the bridge, with never a traffic back-up. How savvy am I? I offer myself this congratulation. Immediately, I find myself sliding down an iced-over driveway into the backyard of an abandoned house. I had missed the Chace Mill cut-through, it seems, but one or two driveways. As I drift sideways to a stop in front of a long battered garage, I'm filled with a sick sinking feeling. My intuition says, you are not getting out of here on your own power. I know this is true because I've been doing this for one thousand years and I can see that the driveway is steep and entirely coated with thick ice. And, if it hasn't already, here's where my stupidity kicks into high gear. I proceed to waste a full half-hour in a futile effort to storm the driveway. 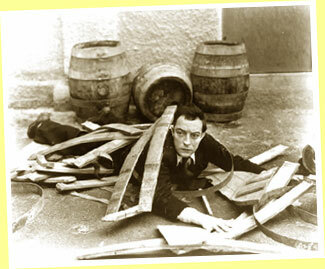 I half wish somebody had video'ed me, because it probably looked like a Buster Keaton film. I rev and rev and charge forward - at best, 25% of the way up - before the wheels begin spinning and I slide back down. 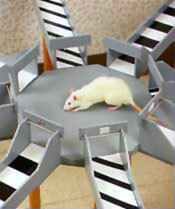 After the 17th attempt, you would think I'd throw in the towel, but, by that point, any shred of rational thinking had evaporated; I was on automatic, a rat in a cheese-less maze. So, I finally call Spillane's and the tow truck driver arrives promptly. He is a big tough guy and I can see that he fully appreciates the doofus-like quality of my predicament. He doesn't want to risk getting likewise stuck, so, remaining at the top of the driveway, he hooks me up with a long cable and slowly winches me out. The charge was $75, and I throw him an extra five for a latte el grande. One would think that after 11 years I'd have the column writing down pat. But I don't. What follows is a recently composed would-be story. I realized, after the fact, that it didn't pass muster as a "Hackie" column. Not that it wasn't good enough, but it fell outside of the "Hackie" brand that I have established: it's insufficiently tied to the taxi biz and it's too much my musing about life. (A little of my thoughts per story go a long way.) Read it and I bet you'll understand what I mean. In any event, I hope it will make a dandy weblog post. Thus spoke Mayor Clavelle. It was 1999. Bill was in the White House; “W” merely the 23rd letter of the alphabet. Sigh . . .
That's one for the books, I thought. How often does a politician decline credit for good news? The city dedicates a parking space on Main Street for the mayor of Burlington, a modest job perk on what can sometimes be a thankless job. The mayor's spot is directly behind the taxi stand so I would often run into Peter and we’d chat some. 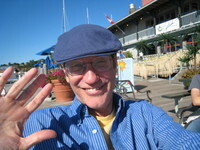 Our Past Distinguished Mayor – for those who don't remember – was one of the all-time champion schmoozers. I'm no slouch in that department myself so – what's new? At times a mayor perfectly reflects the temperament of the city he or she governs. Ed Koch – Da Mayor – was New York City: brash, cocky and perpetually slightly irritated. How'm I doin'? was his mantra, and New Yorkers let him know in no uncertain terms. (The denizens of the Big Apple exhibit a subway car of colorful traits, but “uncertainty” they don't know from.) Similarly, from 1996-2004 in San Francisco, Willie Brown was the embodiment of the City by the Bay: flashy, outrageous, cutting edge in his ideas, but down-to-earth just the same. In Burlington, I think we definitely had that type of match in Mayor Clavelle. Bernie Sanders, as mayor, was a firebrand, a passionate ideologue who nonetheless delivered on an agenda of progressive modernization. But as much as there was to admire about Bernie’s municipal reign, he was not by any stretch your prototypical Burlingtonian. Does anyone still remember Peter Brownell? For one lone term, 1993-95, this other Peter temporarily interrupted Clavelle’s long-time mayoralty. I recall Brownell as the “reluctant” mayor: if nominated, I will not run; if elected, I will not serve. An eminently decent guy and competent administrator during his brief ascendancy, he clearly had some problem with the “vision thing,” as Bush the Elder once dubbed it. Also, let's just say, he was perhaps a tad charismatically challenged. Peter Clavelle, on the other hand, was born to be Mayor of Burlington. He grew up in the Onion City, part of a large and close-knit family at the center of the larger tight community that was Winooski in the 1950’s and ’60’s. First, as one of Bernie’s right-hand people and, then, as his mayoral successor, Peter brought to public life all those qualities so endearing to Vermonters: self-effacement, practicality, a genuine affinity for the common man and a passionate desire to do the right thing. This appeal didn’t quite translate to his 2004 gubernatorial bid, but didn’t the man known with affection around town as “Moonie” embody the best of the Queen City spirit? Huey Lewis once described the stark choice facing every rock star: you can either goad the kids to run with the devil or you can sing about the power of love. I always believed the same dialectic applies to political leaders. They can either call forth the best impulses in the electorate – the yearning for justice, compassion and decency – or they can evoke and stoke the public's fears, prejudice and selfishness. In my lifetime, the national political figure that most inspired me was Bobby Kennedy. After his brother's death in Dallas, he drew into himself like a wounded animal for almost a year during which he read widely and soul-searched his destiny. He emerged with a commitment to serve, to do all within his power to bring forth the highest ideals for which our country stands. After winning a senatorial race in New York State, Bobby ran for the 1968 Democratic presidential nomination. By all accounts he was a phenomenon on the stump. Among national politicians, only he and he alone could speak to the aspirations of the disaffected young, the increasingly angry black population – Dr. King had been assassinated earlier in February of that year – and the hopes of the broad middle-class. Plus, on the most pressing and divisive issue of the day, he had come out decisively for ending the Vietnam War. On June 4th, he won the California and South Dakota primaries. The Democratic nomination was becoming a real possibility, and who doubts that he could have handily defeated a washed-up Republican nominee, Richard Nixon? On the night he was shot – just after midnight on June 5 – I was all of 14 years old. When I woke up to the news, I took off on my bicycle riding aimlessly through the streets of Brooklyn, tears streaming down my face, repeating over and over in my thoughts, C'mon Bobby, hang in there. I didn't know at the time, but I was praying, me and millions of others. But his time was up; the following day he died. I’ve mentioned this before, but it keeps coming back to me: I don't know if Barack Obama has what it takes to effectuate the hopes and dreams he so magnificently inspires. But – my God – isn’t it worth the chance? I was driving a regular customer, an older woman, to visit with her husband who lives at the Starr Farm Nursing Home. Josephine is thin and never without her over-sized dark sunglasses. She still dresses stylishly, strictly from Talbot's on Shelburne Road. She's a private person but for some reason she opened up to me on this day. "Did you know that Frank and I met on blind date when he was at Harvard?" "I didn't know that, Josephine. So, was it love at first sight?" "Oh, goodness," she replied with girlish giggle. "Far from it. The date went horribly. You see, I was so very shy when I was young girl. Not anymore, mind you - life has taught me better. But he called me back, all right." "That's a great story, Josephine." "Wait - it gets better. We soon found out that we were birthday twins." "Birthday twins? You were both born on the same day?" "More than that. We were born on the same exact day. The same day and same year." "Wow, that's quite amazing, actually. What a connection." We arrived at the nursing home. This location is poignant for me - my father died here a few years ago. I asked, "How's Frank doing?" "Not so well, Jernigan," she replied, not matter-of-factly exactly, but without evident emotion. It is how we humans survive this stuff. "He's had another stroke. 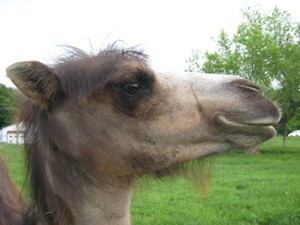 But he's always glad to see me, so I think these visits help somehow." Josephine paid me the fare and added, "There's no place I'd rather be than by his side. This never changes." "My mom's favorite was Bonnie Raitt." The three young women in the back of my cab were chatting about the musical preferences of their respective parents. Sitting shotgun next to me was a tall good-looking guy, with short, curly black hair and a rangy, athletic build. The two of us were listening to the conversation among the women, smiling at each other at the funny parts. "I remember once - I must have been, like, ten - a Phil Collins song came on the radio. I turned to my mom and said, 'What's this?' She says, 'That's Phil Collins.' I'm, like, 'No, mom - I mean, like, what kind of music is it?' 'OK, I see,' she says. 'Sweetie, it's soft-rock.' And, I'm, like, Ooh - I like soft-rock.'" Everyone laughed at the sweet story. This is a nice group of people, I thought as we headed to the Riverwatch Apartments. So many people, young and old, are so bitter and angry these days about, well, everything. This group of friends had a relaxed camaraderie which was a pleasure to experience, even just as a cabdriver for a short hop down the road. The woman sitting by the passenger side window reached forward and gave my seatmate a rub on this shoulder. She was Asian and wearing one of those puffy white coats so popular among the girls this winter. (I'm sure there's a better name for the garment than "puffy white coat," but there you go.) The hood was lined with soft gray-and-white-streaked fur that circled her face and she looked utterly adorable. She said, "Blake, are you ready for the party with my folks tomorrow?" "You bet, honey," Blake replied. "I love hanging out with your parents. They're a trip." "Well, they love you. It's so funny, though, my mom keeps calling you 'Brake.'" "Yeah, that's great. And your dad, what does he call me - 'Flake?'" "I gotta talk to that guy. I mean - he's not even trying! Don't take it personally. I know he likes you." "Hey, you," Blake said and pivoted in his seat to exchange a moment of love through the eyes with his girlfriend. "They can call me anything they like." The two lovers smiled at each other in a way that lit up the whole vehicle. "Anything," he repeated. The two young men in the back of my taxi were jabbering away in English - that is, the Queen's English or some variant thereof. There's so many English accents and I can't distinguish one from the other unless the blokes are from Liverpool. That's courtesy of the Beatles, natch. It was late afternoon and we were on the way back to the Holiday Inn. The guys were in town to look at Champlain College. One of them was slight, nattily-dressed and black. The other guy was chunky and white with a nonstop smile, just happy to be alive and visiting the colonies. It's amazing, it occurred to me, how far Champlain - this once junior college - has come over the past decade to the point now of attracting international students. "Can you recommend a good restaurant?" the skinny guy asked me. "You're in luck," I replied. "Burlington has a slew of great places. If you're in town for just the one night, you can't go wrong with A Single Pebble. It's Chinese cuisine but not the Chow Mein and whatnot that you usually see. The chef actually studied cooking in China, so the dishes are all authentic. Anyway, you'll love it - I guarantee. Money back from me if you're disappointed." "Sounds brilliant," the guy said. "OK with you, Nick?" Nick nodded and said to me, "Could you pick us back up at seven?" "Oh, yeah! For a live sporting event, nothing beats hockey. The players are flying up and down the ice, smashing into each other. It's awesome, man. Trouble is, the UVM games are always sold out, so I doubt you could get seats." "Can we go to the arena and give it a try? Maybe there will be touts selling tickets." Touts? I delved into my mental English-American dictionary. "Do you mean scalpers?" I asked. "Yes, that's it. We call them touts." Sure enough the guys found a tout with a couple tickets and they told me they'll call back in about an hour for their late reservation at A Single Pebble. I went about my night listening to the game on the radio. No call from the Brits after the first period. No call after the second. Only after the game was over, well past 10 o'clock, did they finally contact me. I spotted them in front of the Gutterson Fieldhouse and they looked as excited as a couple of kids after a day at Disneyland. "That was brilliant!" the thin guy said as the two of them settled into the back seat. "We need this in England!" "Yup, hockey's great, all right. Not real compelling on TV, but live - there's nothing like it. Hey, you guys still planning on eating out? I don't know if A Single Pebble is open this late, so maybe some other joint?" The two of them laughed. "No, we both ate at the match," Nick replied. "So just back to the hotel, if you would." "You ate dinner at the Gut?" I said. "That's perfect. What did you have?" "I ate nine hot dogs," the big guy said. "And," he added with a sly smile, "I'm proud of it." Last night was a strange one. Early on things were super-slow. The "adults," it appeared, were not yet recovered from the holidays and were staying home. So, I ground it until the "kids" began showing up around 11'ish. Business picked up, but it was not one of my better nights. Such is January. At some point, I picked up a nice-looking couple, perhaps in their early thirties. The man and woman were about the same height, which I find cool. They gave me their address, which was just past the police station on North Avenue. "Sorry it's such a short ride," the woman apologized in a German accent. ""No problem whatsoever," I replied. "My belief is that people should take more cabs, whatever the distance. Why hoof it when you can ride?" Al Gore would hate me. "Where you guys from?" I asked. "We're both from Hamburg," the woman replied. "Do you know Hamburg?" "Of course I know Hamburg," I replied. "For goodness sake, it's where the Beatles honed their act in the late fifties. It's a wild and raunchy town, baby!" As we cruised past the Hilton, I asked, "Do you work in town?" "Yes, both me and my husband" the woman answered. "I'm a jeweler at Grannis Gallery." "Ooh, I love that place. The quality of their gold work is amazing. Isn't it something to perform a job that has been around for thousands of years?" "Yes, the tools have changed somewhat, but it's still sitting at a desk, tapping and getting dirty." "You know my job is one of the oldest, too," I said with a laugh. "What do you mean?" the husband joined in the conversation. "There have only been automobiles for maybe 100 years." "Ah, but what of the coachman and the ferryman?" "OK, I see what you mean," the man conceded. "Of course," I added as we stopped in front of their apartment, "we all know about the oldest profession." "Oh, yes," the woman said with a laugh. 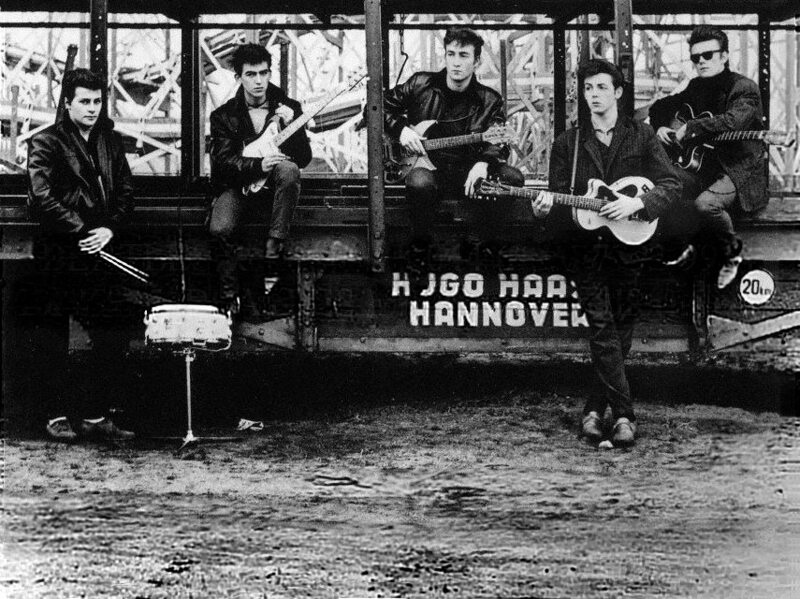 "We are from Hamburg. We know all about that!" Though it sometimes seems that way, not all the downtown weekend revelers are young and unattached. Saturday night I drove a married working man home from a night out with the boys. I could tell this was not a regular occurrence for this man with a wife and a couple of young kids at home. For almost the entire ride to his home near the Harley-Davidson dealer next to the Essex fairgrounds, he plied me with questions about the taxi industry. "Is it easy to get a cab license in Burlington?" he got it started. "It's too easy, in my opinion," I replied. "There's no limit on the number of cabs the city will allow. In most big cities, they regulate the number of taxis. Without a limit, it can become a race to the bottom 'cause nobody's making money. Burlington, unfortunately, is getting to this point." "How do they limit the cab numbers?" "Well, I can speak from experience about the New York City system. 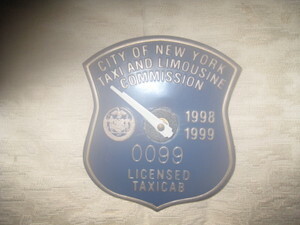 The number of cab licenses was fixed at about twelve thousand. I think this was in, like, 1952. So, in order to operate a yellow cab - which are the only ones that are permitted to pick-up random fares on the streets - you have to buy a license from someone who already has one. Because of this, it costs a small fortune to get into the taxi business in that town." "Believe it or not, I believe a single medallion recently changed hands for over a half-million dollars." "Medallion? What do you mean by 'medallion'?" "Sorry, man," I said. I felt like I was in a 60 Minutes interview. "The medallion is this octagon-shaped metal tag that gives you the right to pick-up on the streets of the city." "I understand. So you carry this around in the cab or something?" "Nope, it's affixed - welded, I guess - to the hood of the taxi. Looks kind of cool, actually." We turned at the Harley dealer and wended our way to the guy's house. "Well, that's what I do for a living," he said just before we parted. "I don't follow," I said. "Do what?" "I'm a welder at Velan Valve." "It's a good company - plenty of well-paid, steady work." Last night northern Vermont descended into the deep freeze, which is just how I like it when I'm driving cab in the winter. Cold people, you see, hate to walk outside. Plus, there is the added bonus of various car problems, such as my favorite - the failed battery. (In my own vehicle, I've installed a battery with the firepower of a small nuclear reactor, so I'm set.) With the students back in town and flush with cash, I saw a brisk business through the night. One of my late fares was four vivacious young women, perhaps in their mid-twenties, and obviously old friends. Sitting shotgun was their de facto leader for the evening, an energetic and talky brunette. It seemed the group was staying over at her place on Shunpike Road in Williston for the overnight - a classic "girl's night out." She pivoted in her seat and announced over the chat and laughter, "You all remember to get up early for the fabulous breakfast I'm preparing, all right?" "Jen," one of her friends responded, "are you gonna tell us the nature of this awesome breakfast?" "Nope," Jen replied. "It's a surprise. You better like cheese, though." "Oh, God - not the cheese!" her friend said. "Hey - don't dis the cheese. When I was a girl, we would have blocks of cheese delivered to our farm in Brookfield." "Cheese delivery? You really are a woodchuck, Jen. You know that?" "Well, the cheese was from Cabot, and we were a Cabot farm." As we sped past the Williston Road hotels, the girls in the back went back to their conversation while Jen sat there texting at hyper-speed. "You texting the Holsteins back at the farm?" I asked. I get funnier as the night goes on. By midnight, there's no stopping me. "Holsteins?" Jen replied, spitting out the term as if I had said "mutant orangutans." "Do you think that all Vermont dairy cows are Holstein? There's six major breeds - Brown Swiss, Guernsey, Ayrshire . . ." She sat with her eyes puckered and glancing up and to the left as she tried to recall her cow families. "In 4H, we had to memorize these things. Anyway, our farm has pure Jerseys. The "Queen of Cows" my dad calls them. 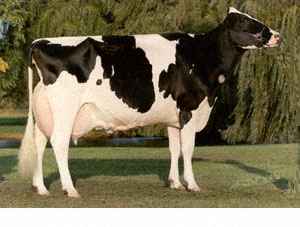 They're smaller then the Holsteins, but they produce a higher quality milk." "I got it," I replied, duly chastened. How could I have even imagined she'd be texting Holsteins? "What size herd do you run?" "About 40, give or take." "Do you have names for the individual cows?" "Well, I know a few of 'em personally. But I've been living in Willston now for a while, and you kind of lose track. My dad, though, he names each and every one, and can identify them as they approach the barn. He really talks to them like they're pets or something." "Well, " I said, "I guess Jerseys need love, too." "Don't we all?" said Jen, flashing the sweetest country-girl smile. "Don't we all?" For the rest of the night, I rode with visions of a hearty Vermont breakfast, replete with Cabot Cheese.